Oh my gosh, I’ve traveled a lot, I’ve been to some amazing places. Being at camp in Kunming was the best because it meant something. It was cool to bond with my translator, develop that relationship and see how that progressed. One of the camp translators heard a few guys and I talking about God and so he went and talked to Tim Hedden, our camp director, and accepted the Lord. When we came back from the city that afternoon, the translator came up to me and said, “Guess what? I’m you’re brother in Christ!” That was awesome. The other volunteers there were amazing, really stellar people. It was rad to be around a group of Christians who I could talk to and who challenged me. Saying goodbye to the kids was really hard. And it was one thing after another, but it was great. There’s no other way that it could have been any better. It was perfect. I learned that I want to adopt a Chinese orphan in the future. I want to go back so bad. I still think about China everyday even though I’ve been home for a while now. I look at my pictures, email the translators, and try to maintain friendships I made with people there. In China I met Christians who love God so much that they would put themselves at risk for their faith. The believers there have a thirst for God that inspires me. One night in China I was talking to my friend Chris about how I was feeling ashamed for not stepping up and sharing my faith more when I could be. But I realized that God isn’t looking at me with anger but with love and readiness for me to grow. What would of you have missed if you didn’t go to China? I would have missed out on getting to see how blessed I am. My family and I have so much and yet the kids in China have that same joy when they don’t have much. The friendships I made, with Josh and Chris especially. I would have missed out on being challenged and encouraged by them. And I wouldn’t have gotten the chance to know the kids and work with them. I was able to meet my buddy’s caregiver and she told me how she could tell how much I loved this little boy and cared about him. It was really an opportunity to reflect Christ’s love. What would you say to anyone thinking of volunteering at camp next year? Aw, man. I would say “GO!” It was the best experience. The kids are so awesome. Regardless if you have ‘Happy’ or ‘Juan’, (an easy-going or a high energy kid) it’s impacting their life. I got lucky because I had awesome kids, but it’s not how easy we have it during the week, it’s what can I do so that they know they’re special. The first time they take your hand you think, ‘this is rad!’ It ends up being a blessing to you to. 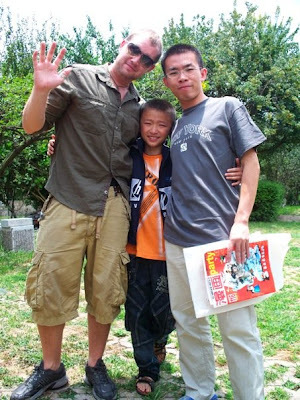 Doug with his orphan buddy and translator at camp. The infamous cake fight lives on! This entry was posted in Bring Me Hope News and tagged Camp on September 20, 2009 by admin.